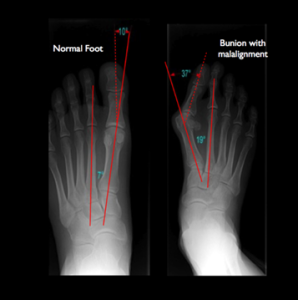 A bunion or hallux valgus is a common foot deformity that affects your big toe. The first long bone in your foot (first metatarsal) deviates towards the other foot and the big toe angles towards the second toe which often overlaps it. 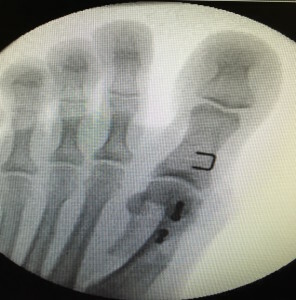 A deviation of 15 to 20° is considered abnormal and has a huge effect on overall foot function (biomechanics) and can lead to irritation from footwear, difficulty wearing shoes as well as pain and discomfort. The cause of hallux valgus is not completely understood but certainly poor footwear, genetic factors and gender all have a role to play. There is also a higher incidence of bunions in older people and patients with some degree of hyper mobility. Bunions are not always painful but as they progress can become more painful over time. Conservative management may be an option in some cases and changing footwear to reduce irritation can often be enough to have a major positive effect. Orthotics (special shoe inserts) and splints to reposition the toe are also commonly used but with varying success and unfortunately may only do so much for a patient. Unfortunately some bunions go on to become arthritic and often medications can be prescribed to reduce pain and swelling. Padding and other local treatments may also help but ultimately surgery may be your only option. The aim of any bunion surgery is to straighten the joint as much as possible and to relieve pain. 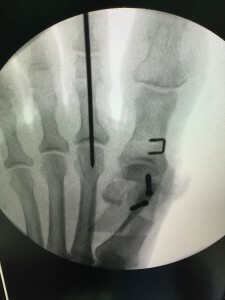 A number of different surgical procedures can be undertaken to do this however the surgeon’s experience, x-rays and suspected bone quality are used to determine which operation is the most appropriate. Additional procedures are often indicated for some patients and can be done in one sitting in an effort to reduce the amount of time patients have to spend recovering. More information on all of the procedures listed above as well as applicable after care and information can be found in the PDF document available below.